Yesterday, breakout hitters of the second half were covered. Today, it is the pitchers. Usually once a pitcher has a spike in their development, they don’t get to breakout again. By that definition, I had to rethink who the breakout pitcher of the second half was going to be Matt Swarmer easily won the breakout pitcher of the first half. But Keegan Thompson and Cory Abbott also had breakout campaigns at their first full season affiliate. So, by definition, all three could not win the award for the second half, even though they all did have another spike in their development in the second half of the year at a new affiliate. This is the first year in a long while I can remember so many pitchers in rookie league having a pretty decent season. This year‘s crop includes some junior college players and young international free agents. I’m excited to see if these guys are going to end up next year in Eugene or at South Bend. To begin, Peyton Remy was somewhat of an ace for Cubs 1. He led the team into the playoffs and was pretty dominant in July and August. For the season, Remy struck out 59 in 52.1 innings with an ERA of 2.58. He even got to roll with Eugene in the playoffs and was brilliant in the Hillsboro series throwing 3 scoreless in relief and 4 more scoreless against Spokane in the clinching game. 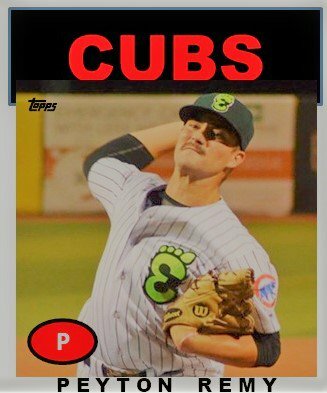 Blake Whitney played for Cubs 2 and had a pretty decent season after being drafted from South Carolina – Upstate. His campaign was surprising because most pitchers that were drafted as starting pitchers only go 2 to 3 innings or 50 pitches. He went 5 innings in 3 of his last 4 appearances. Whitney had a 2.30 ERA and struck out 37 in 31.1 innings. Jesus Tejada and Didier Vargas were both excellent starters for Cubs 1. I still think they’re both busting out next year. Vargas puts himself in to contention because he just misses him a lot of bats at 19 years old. Both will be pushing for a spot in South Bend next spring. 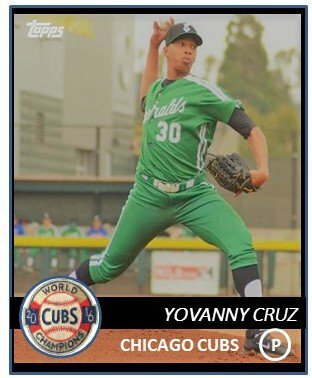 Yovanny Cruz only made one start for Eugene, but he flashed an amazing curveball for a 20-year-old kid. I came away extremely impressed with his command and ability to keep hitters off balance. 2018 draft picks Paul Richan and Riley Thompson each had their moments of dominance this summer. I came away especially impressed with Thompson who is being converted from a reliever to a starter. Right now Thompson is a little bit on the effectively wild side with his secondaries, but he has pretty good command of a 95 mile an hour fastball. It’s pretty dangerous and pretty cool at the same time. And the winner is…from South Bend…sort of. A lot of people were aware that Brailyn Marquez had some talent. He could throw in the low to mid 90s but had huge command issues in the Dominican and at Mesa last year. When he arrived at Eugene in June, I was excited to see the 19-year-old lefty have a go at it. Marquez had a nice jump in velocity this year as he sat 94 to 97 most games and he did so with decent command. He used a slider with a nice 10 to 4 break, sometimes 10 to 5. Against a right-handed hitter, it was just devastating at times. He didn’t throw his changeup a lot, but when he did he seem to have better consistency with it as the year wore on. 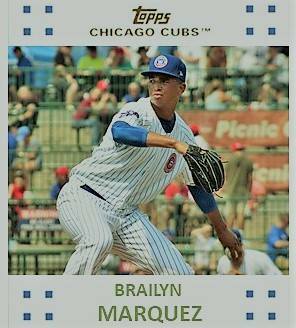 With just a couple weeks to go in the season, Marquez was promoted to South Bend and he did OK in 2 brief starts. I’m pretty pumped to see him go at it for about 120 innings next year. If he can control and flash 3+ pitches, which is what Marquez has, he might be flying through the system as a 20-year-old. The keys are just command and efficiency for him.